Since fillers are more popular than ever, they have become even more improved over the years with longer-lasting results as seen with FDA-approved Juvéderm. Houston area cosmetic surgeon, Dr. Kristi Sumpter, injects the filler to add fullness to areas with low volume and to fill in and smooth folds, lines, and wrinkles. It is also used for cheek augmentation to give patients a nonsurgical "cheek lift". This gel-based hyaluronic acid dermal filler is easily absorbed into the skin, providing a natural look and feel. Hyaluronic acid is a substance found naturally in the body and Juvéderm is manufactured in a way to provide the highest concentration of cross-linked hyaluronic acid as compared to other fillers. Juvéderm comes in various forms - and we are proud to offer these choices to our patients depending on their unique needs and aesthetic goals. The product normally lasts 8 months with some variations remaining for up to 12 months or longer. Our Houston, TX cosmetic surgery center offers several variations of Juvéderm, including both Juvéderm Ultra, as well as Juvéderm Ultra Plus and XC. We also offer Volbella, one of the newest formulas that specifically targets the area around the mouth and Voluma, a sought after filler used for the cheeks. During the consultation, the lines and wrinkles on the face will be assessed to determine which formula will offer the most optimal results. On average, results from most Juvéderm injections have the ability to last up to a year. Many patients return before then to maintain their results. 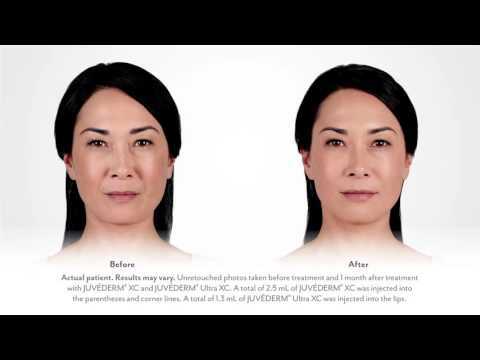 Juvéderm XC: Juvéderm XC has a gel consistency that works beautifully on your moderate to severe folds in the nasolabial area and facial wrinkles. It is used to soften laugh lines and can also be used under the eyes, in the lines between the brows, and in the lower face around the mouth. Juvéderm Ultra & Ultra Plus: For 12 months, Juvéderm Ultra & Ultra Plus injections can augment your lips and perioral area. It has been a common injection to fill in lines near the lips and to plumpen the lips for added fullness. Juvéderm Ultra Plus is generally used on patients with deeper, fuller lines. Volbella: Volbella, one of the newer Juvéderm products, is a popular injectable used to augment the lips and smooth the wrinkles in the area around the mouth. It creates a softer look around the mouth while at the same time improving overall lip volume and fullness. Dr. Sumpter has witnessed excellent outcomes with Volbella and often prefers to use it for the lips in patient who have thin upper lips and desire a natural looking result. "Dr. Sumpter is the BEST choice for ANY procedure! - I will start off with a disclaimer that I am the world's worst patient. I have a panic/anxiety disorder that causes panic attacks often unwarranted so you can imagine when needles are involved how frantic it becomes. Dr. Kristi Sumpter from day 1 consultation about Juvederm injections to the day of surgery for permanent lip implants was sensitive to my anxiety and single-handedly comforted and..."
Juvéderm is performed during an in-office appointment. Prior to receiving the injection, an assessment will be made as to where the injections will go, and how much of the medication (number of syringes) is needed to produce the desired results. During the appointment, the areas of the injection sites will be marked with ink and a numbing cream will be applied to help with any discomfort. As the solution is injected into the skin, the surgeon will massage the area so that the medication diffuses and spreads evenly. Cold compresses are then applied to help with swelling. After a Juvéderm treatment, patients can return to work, but exercise or strenuous activity should be avoided for about 24 hours. The injections sites will appear red and swollen, but this goes away within a couple of hours. Some patients may bruise, but this is also temporary. The visible results after the injections are noticed immediately. The results will last for about 6-9 months before another round of injections are needed or desired. Our office charges anywhere from $400 up for a single treatment of Juvéderm. The cost will vary based on the formula chosen, the amount of product needed, the size of the area, the amount of wrinkles, and the depth of wrinkles. Patients who are seeking cheek augmentation with the help of Juvéderm Voluma will pay more because it is comprised of an advanced formula that lasts longer than most fillers. On average, Voluma can last up to 2 years and costs around $800 - $900 per syringe. The results save our patients from having to undergo a surgical procedure, such as a mid-facelift or cheek implants. Fillers, such as Juvéderm, are a fantastic way to turn back the hands of time, adding volume to the face and creating a smooth and softer facial appearance. During the initial consultation, we will discuss this product in detail and provide a thorough skin assessment so that we can tailor the best treatment to meet your aesthetic goals. We invite you to call our office today to learn more!